I am a Halloween expert. My kids already have costumes and I can strut by the massive candy mountains in stores. My daughter chose to be a goddess this year – which I think is wonderful given the other costume choices for 10 year old girls (yikes). My son will be a zombie. The truth is NOONE comes to our house on Halloween because we live on a very busy street with no sidewalks. You would have to be a bit suicidal to walk to our door at night. I don’t have to buy candy for Trick-or-Treaters and I suggest that you don’t buy it either……..until October 30th so it doesn’t sit there looking at you. Buy candy that you don’t like. If there is leftover candy, give it away or toss it out. If you can’t give it away then put it in the freezer where you can’t see it. How do you get real food into kids on Halloween? 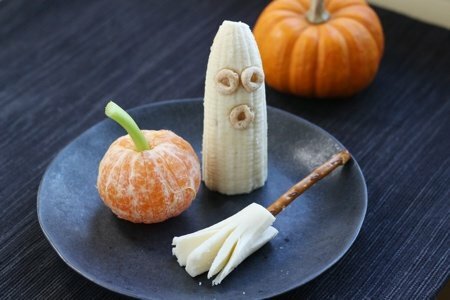 Those are the cutest, most healthy Halloween treats ever! I don't know how you always come up with such unique ideas, but I love them! I enjoy your early morning posts; they start my day on a happy note! Those are cute snacks for home. We have given out single serving size microwave popcorn as treats for the last three years to older kids and Pirate's Booty to the younger ones. Only 1 brand of popcorn is low sodium and low fat with healthy fat so you have to read the label carefully. The kids seem to love it. Last year we heard one little girl tell her dad, "See, I told you this is the house with the popcorn." I've made the bananas before, but I used chocolate chips instead. The cheerios are too close in color to the banana in my opinion, so the chocolate hips make it so you can see the mouth and eyes. I bought glow bracelets this year to give out! What fun ideas! I love Halloween--it doesn't need to be all about candy. Usually my neighborhood is quiet, but on Halloween I think kids are bused in! Though it's not great for their teeth, I give out lollipops. I have a struggle with sweets, and lollys are one of the items that don't tempt me. Also popcorn balls, though they can be hard to find. My daughter said the trick-or-treaters would throw them at me, but some were delighted with this hand-out, especially the older kids. Those snacks are the most adorable thing I have ever seen!! But - "Buy candy that you don't like" - Seriously? There is no such thing....... 8-( Instead, I focus on candy the men in my house like so I know it will not be around long. The brooms are a bit hit in my house. What a cute snack - thanks!